The remotely sensed data provided by sensors on-board the tractors have extremely high spatial resolution, as they almost continuously collect data, as the tractor moves. For some practices, such as dealing with weeds, this spatial resolution is very useful. However, other applications can be performed, even with lower resolution data. In this case, as an alternative to data collected from the tractor, imagery from satellite sensors can be used. The QuickBird satellite is one such example. QuickBird has a 2.5 metre spatial resolution and four bands in the blue, green, red and near-infrared regions of the spectrum. Even though it lacks bands in the short-wave infrared (above 1100 nm wavelength), the presence of the red and near-infrared bands is particularly useful for the computation of the most common vegetation indices and their use in agricultural applications. 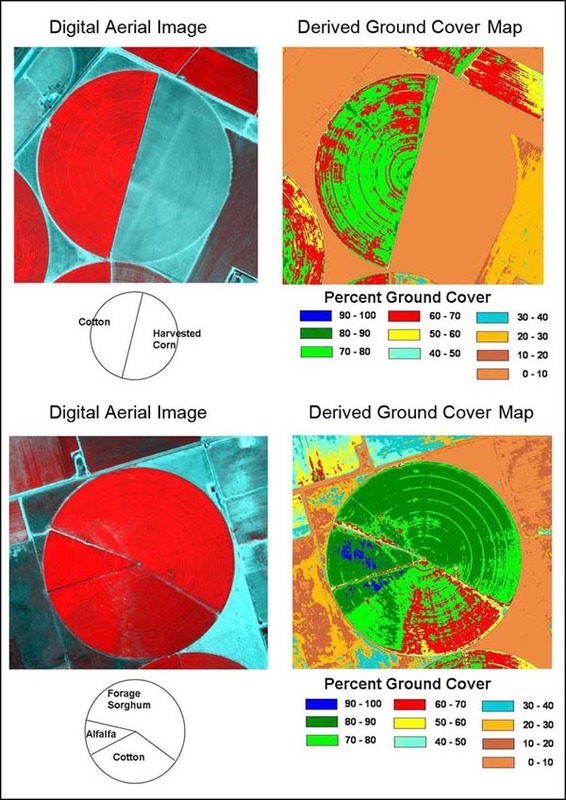 High spatial resolution false colour image and the derived percent ground cover. Pattern of variable requirements for irrigation within one field (green is high, yellow is average, red is low water content) as seen from the QuckBird satellite. 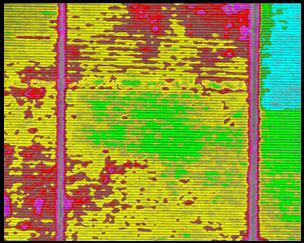 On the image above, we can see the variability in irrigation requirements within one field. Green areas in the centre of the field are adequatesly irrigated, while red areas are in great need of irrigation. Even though QuickBird lacks the thermal bands that are used to estimate water content (see this page for more information), the symptoms of lack of water can be identified with simple vegetation indices. With this information, the farmer will know which areas require more water and adjust the irrigation method accordingly. Question: What are the two vertical gray lines on the satellite image above? The two lines are of course, roads or paths. They appear to have very little moisture and that is either because a) the fields are irrigated along the horizontal lines only or b) the roads are paved and the asphalt does not hold any water.